At 1900 exactly, Team Six set out into the gathering blue twilight. The mission split point was Kaede Ridge, an old strategic hold-over from the last war (and the war before that). It took them just under two days to reach it, moving at a steady wolf-pack pace. The healings had done good work. Raidou felt loose and easy, stiffness erased by a medic’s clever hands. Genma was back to his usual fluidity, loping along with the watermark smoothness of a shinobi in glowing health. The kids were feeling their oats. Raidou could barely keep track of the rapid-shifting alliances between Kakashi, Katsuko, and Ryouma as they squabbled, challenged, teased, and whetstoned each other’s edges. He only interfered once, when Kakashi looked tempted to commit actual homicide. They camped twice, cooking, storytelling, and sleeping under starlight, while Katsuko’s clones kept guard. In the late afternoon of the target day, the ridge came into view. It was dotted with May wildflowers and long grass. At the highest edge, a giant tree had fallen sideways and bleached in the sunlight, broad roots making a pale lattice of dessicated wood. That was the marker. Raidou called a halt in the sheltered lee of the tree, and Genma broke out a cold late lunch. 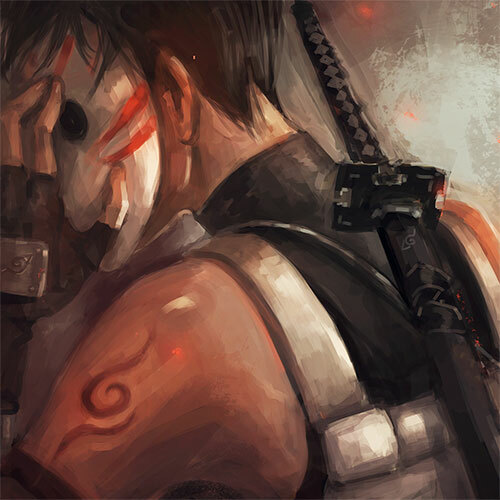 Half an hour, maybe, and they’d splinter out towards their separate missions, running to keep pace with the five other ANBU teams arrowing towards their own goals. Raidou should probably say something. He settled with his back pressed against rough, wind-stroked wood, balanced a pork rice-ball on his right knee and a half-empty canteen on his left thigh, and just looked at his team. Katsuko had draped herself out along the slanted tree-trunk like a leopard preparing to sun itself, with a set of riceballs lined up on her armored stomach ready to be sacrificed. Ryouma sat just beneath her, to Raidou’s left, his problematic left knee crooked up to support the casual elbow he’d propped on it. Genma knelt over his own pack, still doling out lunch items. Kakashi sat a little ways separate from the group, cloaked in the kind of watchful stillness that suggested he was keeping an eye on the horizon. …well, that was one way to dodge mission nerves. “And a cow,” Raidou said. This was something to do with the half-mumbled thing Katsuko had said in the briefing meeting, which meant it was really something to do with the training session Raidou had missed. The only training session he’d missed. And they’d created weird in-jokes about livestock. Raidou couldn’t decide if he was vaguely (ridiculously) jealous, or grateful for sanity-preserving ignorance. “You don’t even wanna know how many goats I think you’re worth,” Katsuko told Ryouma ominously. “You’d have to pay more than a dead rabbit to get ‘Ryouma-senpai’ to notice you,” Katsuko said silkily. Kakashi gave her a puzzled look. He wasn’t the only one; Raidou tipped his head back to stare up at Katsuko, trying to figure out why she’d promoted Ryouma to the position of senpai over herself. Genma was more proactive. A satsuma sailed over Ryouma’s head and bounced gently off Katsuko’s forehead; she caught it before it fell. Kakashi got a look with his flying fruit, but no commentary. Raidou received his via an easy underarm toss, which seemed to be less of a criticism and more of an invitation to vitamin C.
“Thanks,” he said, and set a good example by eating it. Katsuko skinned her satsuma and stuffed it wholesale into her mouth, biting down with relish; juice ran down both sides of her chin. Ryouma dropped his head guiltily down, concentrating on peeling his satsuma in one piece before he ate the fruit in neat sections. Kakashi’s satsuma had, unsurprisingly, vanished. Genma sliced his satsuma into four even quarters with a kunai, like an orange, and ate them one-handed while he sorted through his pack, re-ordering his supplies after the lunchtime gutting. None of them were quite looking at each other, and the weight of the upcoming mission loomed like distant thunder. Today we murder people. Profound was probably for civilians and higher-ups, anyway. Strategy was more useful. Kakashi’s ideas for both sides of the mission were simple, succinct, and made surprisingly good use of individual strengths. The team had already covered everything twice, both times they’d camped, but it didn’t hurt to run over the finer details again. Ryouma sketched out two maps in the dirt, laying out blueprint-accurate floor plans of their strike zones. (Apparently no head for letters didn’t translate into a difficulty with pictographs. If anything, Ryouma had a better map-sense than anyone else on the team.) Katsuko slid down from the tree to lean casually against Ryouma’s back. After a moment, she stretched over him and used her sword-point to scratch arrows in the dirt, illustrating Kakashi’s explanation. Genma interjected the occasional quiet word. Every time he did, the flow of conversation changed like a stream flowing through new geography, re-routed by calm landmarks. All Raidou had to do was get out of the way and let them work. Kakashi’s visible eye curved. Katsuko sheathed her sword, thumb stroking the hilt with the faintest edge of leashed impatience. Ryouma kicked the dirt maps away. It was better not to make a production of it. Raidou got to his feet and shouldered his pack, brushing grass away from the seat of his pants. A golden shiver of chakra brushed his skin. He glanced down and found Katsuko ready at his side, faintly vibrating with the need to get moving. Kakashi and Ryouma fell in behind Genma, standing like a brace of Hokage’s guards at his back. The silver and black hair made them look like living ANBU armor, polished and ready underneath the sun. Kakashi snorted, and nodded once at Raidou. “Back up plan?” Kakashi said. Kakashi’s snort was louder this time. Raidou expected her to light up like a megawatt bulb, but Katsuko just gave the lieutenant a single, serious nod and glanced to the horizon, like she was already marking out the trail between here and bloodshed, and planning where she needed to be a shield. Raidou felt his mouth tilt up at the corner. To Raidou’s great surprise, Kakashi gave a low little growl that shivered in the air like something blood-drenched. It clanged weird harmonics into the prehistoric parts of Raidou’s brain that suddenly wanted to be off the ground. Ryouma just grinned, broad and white, like he’d expected that. Katsuko made a savagely amused sound. Well, at least they were bonding. Kakashi’s visible grey eye regarded Katsuko and Raidou for a moment, as if he was printing their faces down into memory, then he pulled his lion-dog mask into place and turned away first. Ryouma followed him, the horns of his ram mask curling up into dark, wind-ruffled hair. Genma fell into easy pace on their heels, a man prepared to run a long leash. Raidou watched them go for a moment. Their destination, Ibaragashi City, was only a short hop away. From the vantage point of Kaede Ridge, Raidou could already see the smudge of city sprawl on the horizon, and the rising smoke from industrial works—if they ran true, Genma’s half of Team Six would be there within the hour. Katsuko and Raidou had a longer run ahead of them, at least forty miles before they hit the coast. “Ready for this?” he asked Katsuko. The first shiver of real adrenaline spilled down his spine. “Let’s,” he said, and set out.